Everybody loves carrot cake, but when you are watching your weight and trying to be healthy, many are often just too heavy and stodgy. 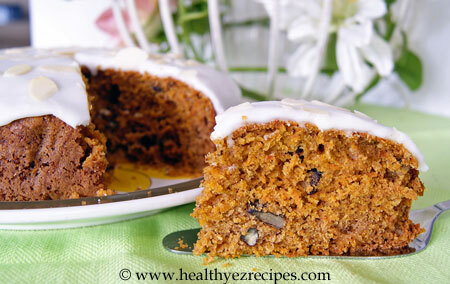 Not so with this healthy carrot cake recipe. It is light, moist and unbelievably tasty. To keep it healthy I reduced the amount of sugar, substituted half the flour for whole wheat and added pecans, which also add a bit of texture to the cake. In keeping with the healthy theme, I chose to cover it with a simple lemon glaze, but if you can’t imagine carrot cake without cream cheese frosting then go with a lighter version. Grease a deep 20 cm / 8 inch round cake pan and line base and sides with baking paper. This will ensure the cake cooks evenly. Preheat the oven to 180°C / 350°F. 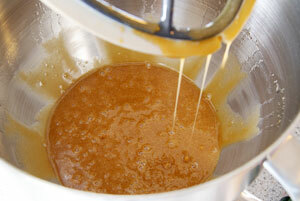 Place the sugar, eggs and sunflower oil in the bowl of an electric mixer and beat on low until combined. 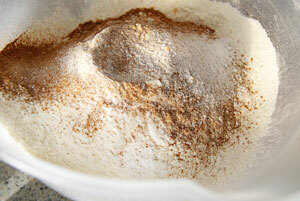 Place the flours, baking soda and mixed spice into a mixing bowl and mix together with a whisk. There is no need to sift the flour. Whisking will aerate the flour and ensure all the ingredients are thoroughly mixed. Add the flour to the egg mixture and beat on low speed with your electric mixer until almost combined. The dough will appear quite thick and gooey at this stage but will become thinner and wetter once you add the carrot. 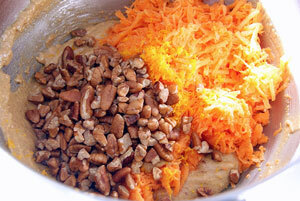 Add the grated carrot, orange zest and pecans. Turn your mixer onto low and mix only until all the ingredients are incorporated. The carrots add the necessary moisture and your dough should now be the correct consistency. Spoon mixture into the prepared pan. Cook in a moderate oven for about 45 - 50 minutes or until cooked. To test insert a skewer into the center. It should come out clean. 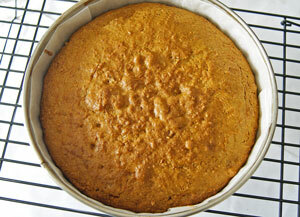 Stand cake in pan for 5 minutes before turning out onto a wire rack to cool. When you cake has cooled sufficiently cover with frosting. To keep this cake light, I have used a simple lemon glaze topped with flaked almonds. But by all mean top the cake with a cream cheese frosting if you prefer. Try this low fat version. You will need about 2 cups of grated carrot. How many carrots is this? Well it really depends on the size of your carrots, but I used about 2 medium sized carrots. Combine all ingredients in a medium bowl, stir until smooth. Adjust consistency by adding more water or confectioners sugar. Spread icing over top of cake.